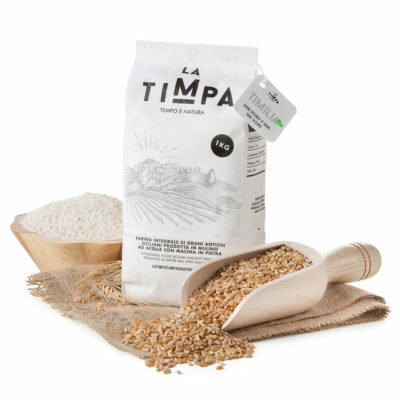 Russello wheat is one of the 50 species of wheat grown in Sicily since ancient times. Its peculiar properties keep the bread soft for up to a whole week, which made it a shepherd favourite as they had to stay out for several days in search of pasture. The name Russello was given for the typical reddish colour of the grain, which gives the bread its characteristic amber colour. The grains are wetted and left 24 hours to moisten in a special tank called “cupboard” before milling. 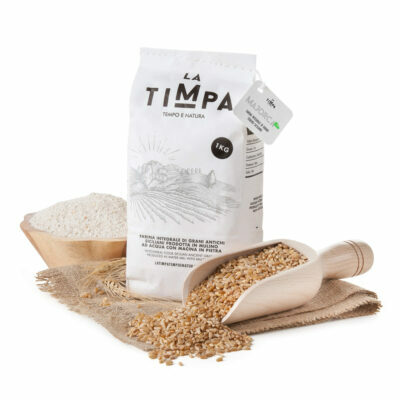 Timpa uses its own completely renovated old water mill with grinding stone, in the valley of Santa Domenica in Ragusa. The flour produced is wholemeal and cold milling maintains its wheat germ active, which is ideal for breadmaking and for the production of traditional Ragusa products such as cakes and cookies.